Report from IMF Fiscal monitor on inequality. Many graphs. I attach four, but do reead the whole thing, rather good I thought. Also covered at nakedcap by Yves Smith. Pew research poll, some god news and some bad. "The share of the U.S. poor population in severe poverty – defined by the Census Bureau as those with family or individual incomes below half of their poverty threshold – reached its highest point in at least 20 years. It was 45.6% in 2016, up from 39.5% in 1996. (The share of the total U.S. population in severe poverty has declined over the past two years, alongside the overall poverty rate.) "
"The Census data show a different trend for American families who were not in poverty in 2016. For the vast majority of these Americans, the average income surplus – the amount a family’s income is above its poverty threshold – was at least $15,000. The share of families above poverty with a surplus at least that large has gradually ticked upward in recent years, from around 84% in 2010 to 87% in 2016." The effects of economic inequality extend beyond economics. Flint, Michigan has a poverty rate of over 40% and has been broke for a decade and is governed by a series of "emergency administrators" who apparently have kept it in a state of emergency. In an attempt to cut costs, the water supply was switched to a cheaper source, which resulted in poisoning the residents. A study by Kansas University now finds evidence for lowered birth rates and more fetal deaths. scarring), compared to other cities in Michigan." The war on poverty becomes a war on the poor. The lowered birth rates noted when the economy falters seems to go against the Republican meme that poor people have babies in order to get their welfare checks. A war on the poor is a fair description of both party's programs in recent decades. Harvard Professor Jeffrey Sachs and other Western economists participated in meetings at a dacha outside Moscow where young, pro-Yeltsin reformers planned Russia’s economic and political future. His website lists much more of his work, which should find support for many of us here. (His work looks very good to me.) That aside, I thought it worth pointing to an interesting paper Russian Privatization and Corporate Governance: What Went Wrong? First, rapid mass privatization is likely to lead to massive self dealing by managers and controlling shareholders …. Russia accelerated the selfdealing process by selling control of its largest enterprises cheaply to crooks, who transferred their skimming talents to the enterprises they acquired, and used their wealth to further corrupt the government and block reforms that might constrain their actions. One of the authors was from Harvard Law School. The other prompt for this post was your comment about Amartya Sen, "Amartya Sen has been an early and a strong voice on [economic inequality]". Yes, that's right but Sen is wrong on growth and climate, advocating economic growth as a route out of poverty. This is not compatible with saving the climate. Jeffry Sachs obviously takes climate change very seriously. (He is director of the Earth Institute at Columbia University). However, from his lecture and response to one question, I don't think he is ready to embrace the rate of decarbonisation we now need. A rate of decarbonisation requires degrowth. If he answers an email, I will report back. Of course, with degrowth we also want redistribution to lessen - greatly lessen - economic inequality. I think Russians who lived through the 1990s have a different view of his responsibility. As to his views on climate change, perhaps we can discuss that elsewhere, rather than this thread ? Again, as to Amartya Sen, I hold him as an exemplar on economic inequality, but not necessarily on climate change. As for degrowth being necessary for decarbonization, I think you will have a tough sell in the developing countries. Try selling that to the western economies first since they caused most of the problem. Yet again, perhaps that belongs on a different thread ? It was a long time ago, but iirc the 'chicago boys' really did a number on russia, revisionism aside. They set [advised on] up a whole series of share distributions, then by any means they financed the forced purchase of those shares. They made back to back deals to buy the shares at a 'fair' price in Roubles, they arranged for the printing, and purchase at a discount, of billions of new roubles and bought those with jets full of $100bills, both small and large shareholdings were targeted. The roubles were paid for the shares were paid for and suddenly 87% of the economy was in the hands of 19 corporations which in turn were overwhelmingly controlled by 27 oligarchs. On thinner ice, again iirc there were now approaching 5 times as many roubles in circulation as previously, the economy tanked. "Billionaires increased their combined global wealth by almost a fifth last year to a record $6tn (£4.5tn) – more than twice the GDP of the UK. " "Billionaires’ fortunes increased by 17% on average last year ..."
The one that struck me was the middle quintile. No wonder opioids are flying off the shelves! If things continue like this only the top 20% of Americans will be able to afford to retire. Which demographic can afford a new (EV) car. Which families can send their kid(s) to a decent school. Who can afford a decent vacation? Almost one in five renting Americans are self identifying as having "been unable to pay their rent in full in the past 3 months"
If you don't pay your rent you get evicted. If you get evicted you'll find it hard to find a rental unit. If you can't find a rental unit, you'll move in with family, or, you're homeless. If your tenant doesn't pay his rent, you'll evict, clean-up, and find another tenant. If you can't afford to evict, clean it up, and find another tenant, you'll miss your payment. Miss your payments and they will foreclose. Three months is a very short cycle. 20% of renters is a very huge number. - and these are self reported delinquencies! How plutocrats block transparency, as revealed in the Paradise papers. All perfectly legal, of course. Credit Suisse 2017 wealth report, or how the 1% screw the rest of us. A look at drivers of capital accumulation, imperatives of the market and the necessity for the left to decommodify as much as possible. "In a community like ours, where property confers immense distinction, social position, honour, respect, titles, and other pleasant things of the kind, man, being naturally ambitious, makes it his aim to accumulate this property, and goes on wearily and tediously accumulating it long after he has got far more than he wants, or can use, or enjoy, or perhaps even know of. " " It is a remarkable property of the modern class structure that any significant deviation by a capitalist from the logic of market competitiveness shows up as a cost in some way — a refusal to dump toxic sludge manifests as a loss in market share to those who will; a commitment to use safer but more expensive inputs shows up as a rise in unit costs, and so on. Capitalists thus feel an enormous pressure to adjust their normative orientation — their values, goals, ethics, etc. — to the social structure in which they are embedded, not vice versa.… The moral codes that are encouraged are those that help the bottom line." "The best that socialists can do is to aim as much as possible to detach social life from market dependence. That means striving for the decommodification of as many spheres of life as possible ... "
"In 2010, it took 388 billionaires to equal the wealth of the bottom half of the world‟s population; by 2014, the figure had fallen to just 80 billionaires (see Figure 4)." In 2017, that number has fallen to eight. Extracts below from an an article by George Monbiot arguing that the current economic model running the world will not sort out economic inequality or even basic poverty, and will of course wreck the biosphere on the way. It is hard to argue against simple arithmetic. Research by Oxfam suggests that the world’s richest 1% (if your household has an income of £70,000 or more, this means you) produce about 175 times as much carbon as the poorest 10%. A global growth rate of 3% means that the size of the world economy doubles every 24 years. Those who justify this system insist that economic growth is essential for the relief of poverty. But a paper in the World Economic Review finds that the poorest 60% of the world’s people receive only 5% of the additional income generated by rising GDP. As a result, $111 (£84) of growth is required for every $1 reduction in poverty. This is why, on current trends, it would take 200 years to ensure that everyone receives $5 a day. I have posted gerontocrats link to Monbiot and some other relevant links to the "Is Degrowth necessary for Decarbonization ?" thread. "Twenty states around the country can seize professional, driver’s and other licenses from residents who default on their student debt. " South Dakota wont even let you hunt, fish or camp. "Nearly 1,000 residents are barred from holding driver’s licenses because of debts owed to state universities, and 1,500 people are prohibited from getting hunting, fishing and camping permits"
"We could easily put even a modest anonymous wealth tax on deposits in the tax havens. What that means is you don't even necessarily have to know who the owners of the accounts are, but the estimate is that the tax havens are home to $20 trillion of deposits right now." it's not the clear who the thieves are, those who charge huge income tax, say >25% some even close to 50% or those who don't want to be stolen their hard earned assets, earned with their live energy and others decide where it's best used. V.A.T. where we pay tax on consumption, means if i spend 100'000 i pay i.e. 22'000 tax and if i pay 10'000 i pay i.e. 2'200 tax. that's the fairest way to tax people and then if we discount all the funds our governments throw out of the window and all the funds they don't invest into necessary projects and calculate carefully a proper and flexible V.A.T. would pay for all that's needed. originally there was the so called 10th, means 10% tax witout exceptions and everything above that is theft. BTW most income taxes were introduced under the disguise of a a specific need that people thought it would end and then stayed and increased ever since. as far as i know canada introduced income tax to finance WW2 and i think it was around 5% income tax then, look where they are now and this applies in one form or another to close to all countries. the other reason for many countries to introduce income tax and other laws BTW was that they saw others doing it and getting away with it. "al capone" stumbled over tax laws is only a nice side effect while the real intention is pointed at all of us. last but not least, avoiding tax costs a fair share of money and if the tax levels would be more reasonable and less permeable and perforated like a swiss cheese, it would not be beneficial at all to pay for tax-avoidance.matter of factly the vast majority of all self-employed workers and business men i've met in 60+ years are in one or another way trying to or performing tax-avoidance or tax-reduction to the possible minimum. the fact that some do it on larger scales and again others are envious that they can do it does not change the fact that the scale does not alter the doings. Flat taxes like VAT are regressive and deepen inequality. As to income tax being theft, as you say, we agree to disagree. But what is proposed by Piketty, Sachs and others is a wealth tax, an idea that goes back to at least Henry George, if not the French revolution. no problem sidd, i respect other points of view, there are simply many different opinions on the matter which is well documented by the fact that each jurisdiction has it's own, often totally different tax law. there is probably no way that this will ever get unified which would be some kind of a solution as well. after all some of the biggest tax heavens with tools clearly made for tax avoidance in favour of foreign entities are not listed as such. Libor rigged. Forex rigged. Now we find T-bond auctions rigged: Just another way the rich get richer. Is there a market that's not rigged ? Yes, my local organic market. Setting up a tax structure to move wealth from the bottom to the top. Is counter productive. Setting up a tax structure to move wealth from the top to the bottom makes everyone better off. Scheffer et al have a paper out in PNAS on inequality in nature and human societies. They use fairly simpleminded models to demonstrate that inequality increases with time, unless counterbalanced by crisis or institutions. As scale increases, this effect becomes dominant. They analyze many communities including plants/trees, fish,rodents, insects,nushrooms, bacteria, and plankton and find broadly yhe same picture. appropriate most of the wealth (Fig. 3 A and B) and the vast majority ends up with almost zero wealth. Very much the same pattern arises from the ecological model (SI Appendix, section 5). The extreme inequality may seem surprising, as no actor is intrinsically better than the others in these entirely chance-driven worlds. The explanation, mathematically, is that due to the multiplicity (gains and losses are multiplied by the actual wealth), absolute rates of the change tend to nil as wealth goes to zero (19). This causes very low wealth to be a “sticky” state, in the sense that getting out of it is extremely slow." "There are essentially two classes of mechanisms that can reduce inequality: suppression of dominance (Fig. 2, III) or lifting the majority out of the sticky state close to zero ..."
"Occasional disasters, such as major wars, may have an equalizing effect by destroying capital or inducing redistribution, but in the long run inequality generally returns to the previous level (31)." "Focusing on Western Europe, we can see how in the Middl Ages, and especially in the 12th to 14th centuries, local communities reduced inequality by limiting opportunities for transacting and accumulating land and capital, and developing mechanisms of redistribution, through guild or community systems, operating at the local level, where most of the exchange and allocation of land and capital took place (4). However, these town and village communities saw their institutional frameworks eroded by the growth of international trade, migration, and interregional labor and capital markets, as well as by the process of state formation with the rise of more centralized bureaucracies in the (early) modern period, triggering a long episode of rising inequality (5, 7, 35). In the late 19th century and early 20th century, institutions aimed at effectively constraining wealth accumulation were developed at the level of the nation state, with the emergence of tax-funded welfare states. Perhaps the most conspicuous of these institutions is the introduction of the inheritance tax, which limits wealth transfer to the next generation (2). Over the past decades, however, globalization has given way to a more unconstrained use and accumulation of wealth (29). The financial playing field for the wealthiest is now global, and mobility of wealth has greatly increased, providing immunity to national tax- ation and other institutional obstacles to wealth accumulation." Postscript: I notice van Nes is an author. I wonder if he has any empirical dynamics/convergent cross mapping overview on the cycles of inequality ? How is that not rigged ? If the externalities of monocrop agriculture, animal concentration camps, fertilizer and waste runoff are not priced, what makes the local organic market price fair ? While I confess to a fascination with the nushroom markets, I'm not sure that proving inequality to be the natural way of things helps our cause. My experience has been that living in a country with greater equality is preferable to living in one where the haves have damn near everything, and the have-nots are often reduced to criminality. How to dispossess the haves of some of their possessions without resorting to bloodshed may be one of those questions forever unanswerable. Shame has been tried, but TPTB made greed a virtue. Such is the power of the media. Nationalizing various industries has worked, but the blowback is fierce. Progressive taxation works, but with government in the hands of the very rich, a flat tax is more likely than a punitive tax on wealth. The snowball has been rolling for some time, and it's mass and momentum now threaten everything in the valley. I want off, and to escape the top heavy avalanche roaring in my direction. Video: Wealth Inequality Most Severe Since Ancient Egypt w/Prof. Richard Wolff at TJDS. More. Lending by big banks to lo income down. No more money there, the banks sucked it all out already. They go to where the money is. Can't have rich people's houses burn.
" “One Fire Truck Guarded Every Three Houses” in Wealthy Los Angeles Neighborhood Last Night "
"Even given the possibility that the Gini coefficients constructed here may underestimate true household wealth disparities, it is safe to say that the degree of wealth inequality experienced by many households today is considerably higher than has been the norm over the last ten millennia." Most of us have a moral sentiment (with other moral sentiments) for an equal distribution of wealth because of our related sentiment of keeping the most individuals as happy as possible. This sentiment is clearly demonstrated when we feed the geese. Economics was distanced from these moral sentiments when Lionel Robbins made the claim that happiness (aka utility or satisfaction) was unscientific because it could not be directly measured. Over 80 years later economists seem still be following Bridgman even though "happiness" is being measured scientifically. We don't need Piketty's excuses to take from the rich to give to the poor. It's often the right thing to do and we don't need Robin Hood's violent method because we have the vote. Robbing people solely on the basis of their wealth and giving money to people solely on the basis of their poverty is wrong, because it subverts the very nature of a cooperative economy. It undermines property rights and removes incentive to produce. I'd say it's "robbing the rich to give to the poor" is right (i.e. a moral sentiment) but partially countered by the other stuff. An argument that may get more traction in our present crisis is that the rich and affluent should be fined for their enormous pollution and the proceeds distributed. e.g. World Wide Carbon Fee and Dividend. P.S. Apologies for the links pointing to too many of my own pieces but I've been struggling with this scientific method/economics and moral sentiments for many years. I still get uptight about it. Until the USA stops forcing it's perverse brand of socialism on the world there's no hope for income equality. That said a simple low universal transaction tax would soon begin to set us free [to build a very different world], personally i'd prefer we all had equal access to credit/debt from a government central bank, which i believe Steve Keen, with the advent of blockchain technology, now advocates. Simon Thorpe, who gets little attention has done a series of posts on the possibilities of transaction taxes, http://simonthorpesideas.blogspot.co.uk/ bear in mind that when you use a card you already pay 2%+ which vanishes from the retailers end. Does education pay - if you're white it does. World inequality report 2018 published, read all about it. Delphine Nougayrède, “Towards a Global Financial Register? Actually the graph shows the opposite. 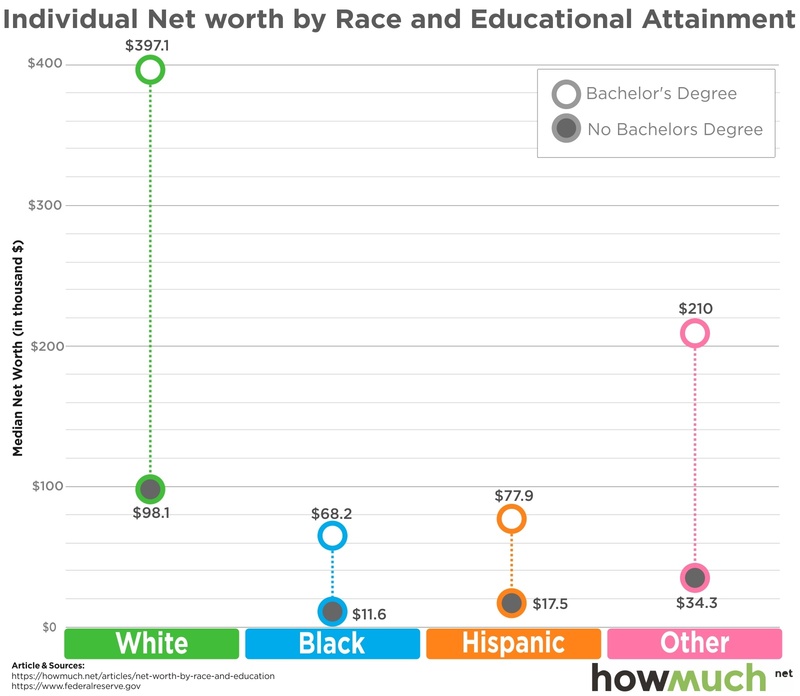 For whites a degree gets pay up by a factor of 4, for blacks and hispanics by a factor of 5, and for others by a factor of 6. Of course, it does pay to be white in this graph, but this is regardless of education level. Keep in mind that they're measuring "Individual Net Worth", not "pay". If the additional years of schooling cost in excess of ~$60K, then the blacks would have been better off if they had paid off their bills, or invested in something other than higher education. At ~$60K a Hispanic would break about even. The problem, as I understand it, is that $60K, plus the earnings lost while in school, won't buy a BA any more. #3, where Americans can expect to live "shorter and sicker lives" was the one that got my attention. I've only been gone >12 years and almost all of my American friends are dead. Amazing. This is strictly an opinion piece, devoid of any provable facts or data. As I see it, both in Canada and the United States, a financial wall has been put in place between the aged and their children and grandchildren. I've read and observed that a large percentage of adults under 40 (+) are now living in their parents homes, or at least having a proportion of their living expenses absorbed by their parents. If you're driving dads old car, joining the parents for a summer vacation, or just relying on grampa to pick up the dinner tab, you fit this demographic. We didn't acquire wealth because we were smarter, or worked harder, we simply lived in less demanding times, and compound interest worked in our favor. I remember 17% interest on a passbook account with the full backing of the US Government. You did need to keep your balance above $5K, but who wouldn't for those kinds of payoffs? Homes I bought for <$30K were sold at huge multiples of their purchase price, and were rented out at a profit while waiting to get the price I wanted. I made my parents house payments for the last 10 or 15 years of their lives, and since then I've been paying my step daughter's family's rent and utilities. The safety nets in the States are shredded, and have been for decades. Receiving Xmas cards that are thinly veiled pleas for the downpayment on another car doesn't really convey the Christmas spirit. They'll come into a nest egg when the wife and I leave, but I've no doubt that it will be gone in a year of living well beyond their means. We didn't plan for this, it just happened. At some point, as this inequality widens, the not so young anymore people are going to lash out. It can't be fun to beg from your parents no matter how accommodating they are. When it comes they'll find that the police and courts have been bought through our taxes and votes, so they'll lose. Then they'll ask us to go their bail. Here in the UK our last election painted an enlightening picture with the right only getting the pensioners vote and all age groups below 50yrs voting more left. This paper is discussed in another thread, but has bearing here, so i repost. It is a report on the two way connection between economic inequality and climate change. Inequality drives murder: "Inequality predicts homicide rates “better than any other variable”, says Martin Daly, professor emeritus of psychology and neuroscience at McMaster University in Ontario ... "
"“The same fact reported [by Piketty] holds true for more countries and more years, and more dramatically,” the researchers conclude." "Overall, if the average annual return on wealth since 1870 has been 6.28 percent, average annual economic growth works out to just 2.87 percent. “The weighted rate of return on capital was twice as high as the growth rate in the past 150 years,” the authors conclude." How to fight for the future: Scotland shows the way.
" ... future-proofing the powers against the kinds of austerity measures that have devastated vulnerable groups in the rest of the UK."